ARTICLE "The Midtown Modern Project" Docomomo Journal, MODERNISM IN THE US AFTER WORLD WAR. September 2004, No. 31. ORGANIZED PANEL DISCUSSION, "Modern Architecture Comes of Age", 2001 for exhibition "Modern Architecture on the Upper East Side: Landmarks of the Future". COORDINATOR AND EDITOR, Manhattan Modern Map with David Reinfurt graphic designer, Fall 2004. Created with Docomomo/New York, World Monuments Fund, and the Buell Center for the Study of American Architecture at Columbia University. 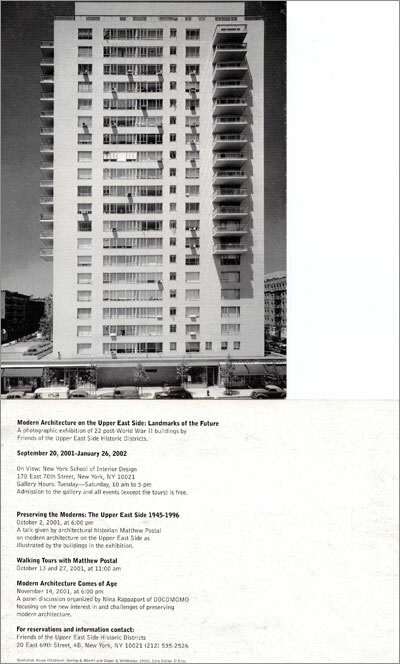 PANEL DISCUSSION, The Skyscraper Museum, "Preserving Midtown Modernism" and "Greening the Glass Box: Saving Modernism in Midtown", 2008 and 2007.